Zhengzhou Ali Brothers is located in Zhengzhou City,Henan Province of China,which established in 1988,is the member ofChina Amesement Mavhine Association,is the company which fixed on research and development,production and sales. new play equipments,and expanding the field of business. Our products are selling to Russia,the Middle East,Southest Asia,Africa,and other countries and regions. 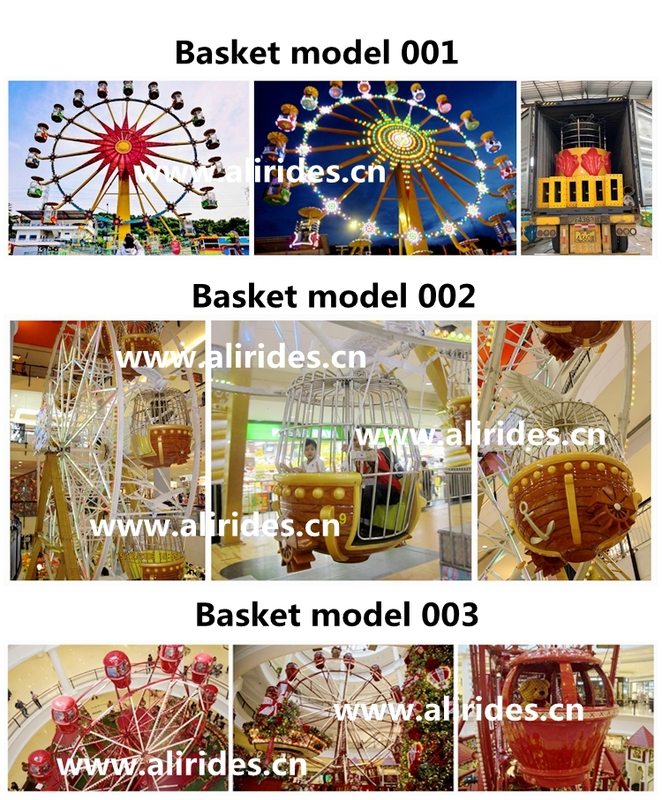 we have different designs of basket ferris wheel"
As a large-scale and exciting amusement park equipment manufacturer, the Ferris Wheel is favored by children and adults in all ages. This design puts more emphasis on the physical appearance of the beautifully designed themed gondolas. Three standard sizes are available for the smaller kiddie models. In other words, no matter what the budget or demographic you are targeting, prodigy can and will meet your requirements. Theming options are endless – from several standard looks to corporate sponsorship designs. 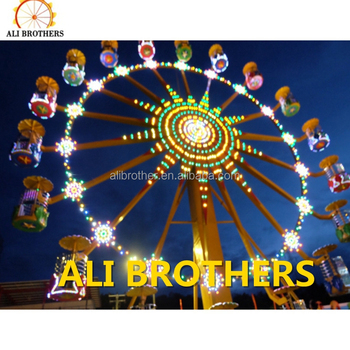 Ferris wheel is very popular installed in theme park, amusement park, which can be made with different height, loaded with different person, from 12m to 88m, maximum loaded 352 person, we can make the giant ferris wheel with two side lights decorations, which is very beautiful at night, which can be changed with different lights effects. Regarding the cabin, above 65m ferris wheel, we will add the air conditioner in the cabin, which is very comfortable during the summer and winter.